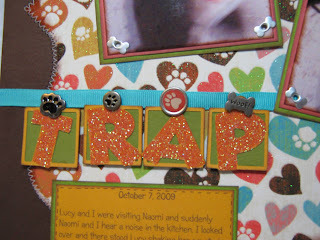 Lucy and I were visiting Naomi one day and Lucy being nosy was snooping around in the kitchen and got her paw caught on one of those glue mouse traps. Naomi and I kept hearing a noise and then Lucy walked over to where we could see her with this trap stuck to her paw and she was shaking her paw trying to get it loose. We laughed until we cried...poor Lucy! In one picture on the right she looks like she is laughing at herself! The pictures aren't too clear since I took them with my cell phone and it doesn't do well with indoor lighting. I am just glad that for some reason I had my cell phone with me that day so I could take these pictures! I used Mickey Font and Don Juan for the title of the layout. On the "the" and "MOUSE" I used cat eye ink to make the two toned lettering. I did faux stitching on the MOUSE and dotted Cinnamon Stickles on the THE. The background paper came in a pack I got at Big Lots during one of Linda, aka LGuild, and I's excellent adventures. I was going to throw away the edges but then my daughter said "SAVE THAT!" 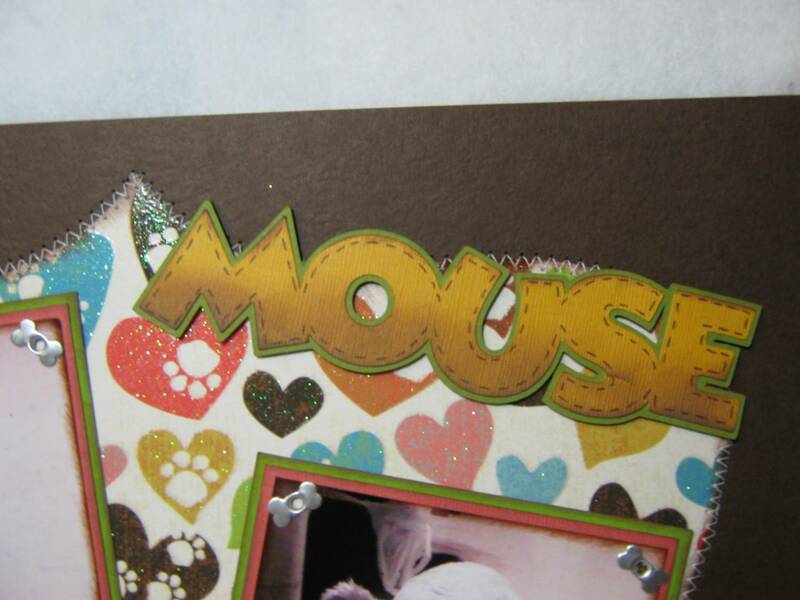 and the she paired it with a piece of green cardstock to use for a different layout sometime in the future. I used my Janome Sew Mini to do the stitching. 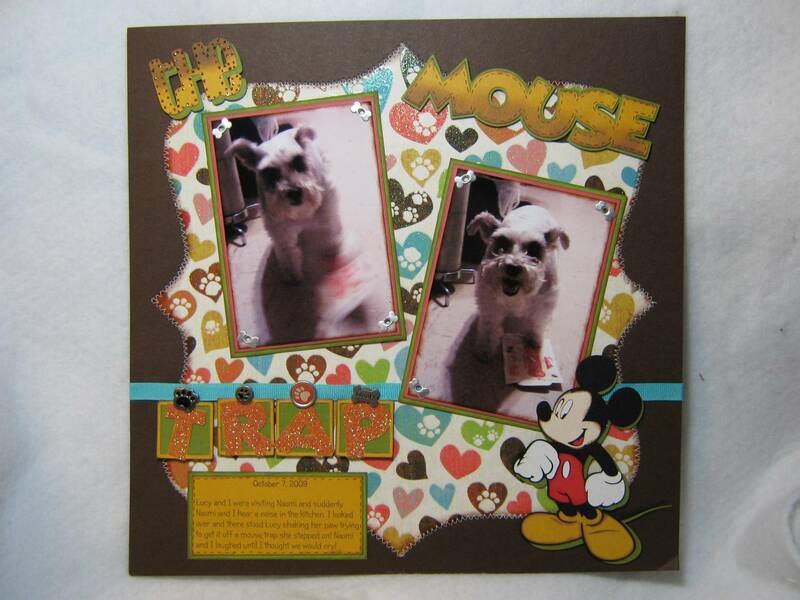 Oh the cut is from Storybook and I used Design Studio to stretch it into a more square design since it was oblong. 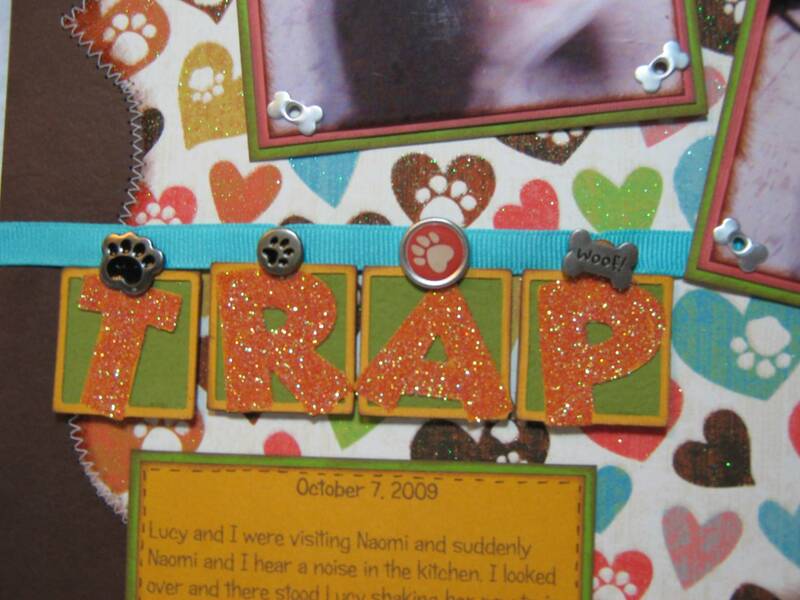 On the "TRAP" I used the charm function and then used a zig glue pen to add the glitter to the letters. I used the red Doodlebug sugar glitter and it actually seemed to match some of the hearts on the background paper pretty good. 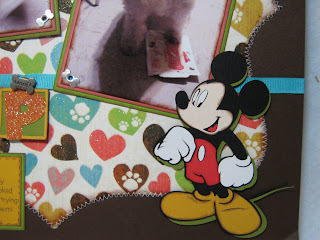 I used 4 different dog themed brads to attach the charm letters onto the turquoise ribbon. 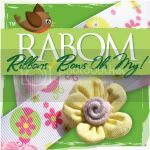 It's amazing what I can find for embellishments when I start digging through my themed drawers! *okie wonders why she thinks of underwear everytime she says drawers and wonders if anyone else does that*. I cut Mickey at 4 1/2 inches *okie thinks it might have been 4 inches*. I liked this pose of Mickey because it seemed like he was saying "GOTCHA". I looked through images on my carts and I was going to go with a regular mouse but since I hate mice and I might like to look at this layout again sometime I thought I better go with Mickey. I mean after all, a mouse that wears shorts can't be a real mouse can he! I think I forget how much I like doing layouts. I get busy with cards since they seem to go much quicker and I don't have to think so hard *okie's extraordinarily large brain gets tired of thinking of ways to make a layout look decent*. I do have to admit I used Pagemaps for the idea for this layout. I am looking forward to taking some time off during the holidays to get some more layouts done! I will be sending 175 pictures to get printed soon so I will have plenty to keep me busy! OMGoodness! When I first started reading your story I was thinking you were talking about one of the snapping metal mouse traps and I was like "Ooooo poor Lucy!" Glad that was the case and you didn't torture her at all by making her stand there to get her picture taken! This is soooooooo cute and makes me laugh!!! I love Lulu's expression. I love this LO, Okie! 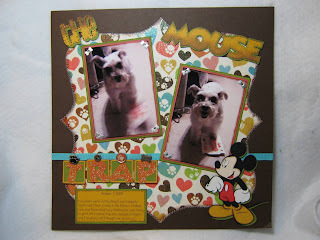 I may scraplift it to do some more of my Disney LO's. Poor Lucy! But even after going through that trauma, she still posed for her glamor shot! Okie, I have a Stylish Blogger Award for you on my blog. Please come by to pick it up. Oh my gosh so funny and a great layout. I guess it's from being a GRITS! 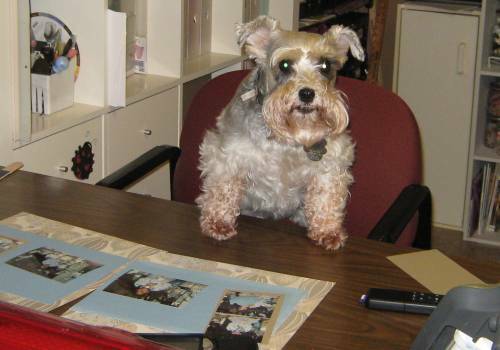 Oh poor Lucy ... but what a wonderful photo op she gave you! *wink* Our animals ... you just gotta love 'em! 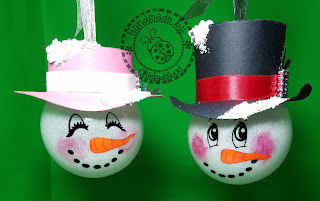 And love this fun LO too! You are so awesome, I love your layouts and your cards..can't wait to the layouts that you do for the 175 pictures.